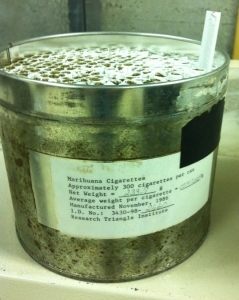 Since the late 1960s, the marijuana research lab at University of Mississippi’s School of Pharmacy has been the only facility in the United States permitted by the federal government to cultivate and study cannabis. You may even be aware that University of Mississippi (or “Ole Miss” as it is colloquially referred to) has been supplying medicine to a select group of medical marijuana patients for nearly 40 years now. Following a landmark lawsuit in 1976 in which Robert Randall demonstrated his medical necessity for cannabis (Randall v. U.S.), federal Judge James Washington ruled, “no adverse effects from the smoking of marijuana have been demonstrated… Medical evidence suggests that the prohibition is not well founded,” and the Compassionate Investigational New Drug (IND) program was formed. Surviving patients of the Compassionate Investigational New Drug program still receive a large tin of machine-rolled joints each month, and as IND patient Irvin Rosenfeld will tell you, it’s low-grade shwag on par with Mexican ‘brick weed.’ Not to mention some of the buds used in the joints have been sitting around for upwards of 10 years. This product is not at all comparable to the high-quality crops available in any of the nation’s state-legal medical marijuana dispensaries. Despite loving the smell, research professor Dr. Mahmoud A. ElSohly has never used marijuana, which is all the more apparent when you learn that the joints his lab has been manufacturing for decades contain ground up stems. For future reference, Dr. ElSohly, stems are byproducts of the plant which patients and users avoid smoking [and vaporizing] due to the unpleasant, harsh smoke they produce. One could argue that such a naive perspective on the plant’s use may have a negative impact on the objective assessment of how cannabis smoke actually affects the body. After isolating these cannabinoids, the scientists observed their effects on mice, noting that compound 3 “exerted the most potent cannabimimetic-like actions,” while compound 4 “showed partial cannabimimetic actions.” Additionally, they report that compound 2 “displayed a dose-dependent hypolocomotive effect only” (hyperactivity), which seems to indicate that some of these cannabinoids have psychoactive effects similar to THC. Marijuana activists and opponents alike have been petitioning congress to allow more research, and though the NIDA’s decision to renew with University of Mississippi (over, you know, any university in Colorado) is questionable, the passing of the CARERS act will help more American scientists gain legal access to cannabis to study its potential medicinal benefits.